With new hardware, comes app updates to support new features. 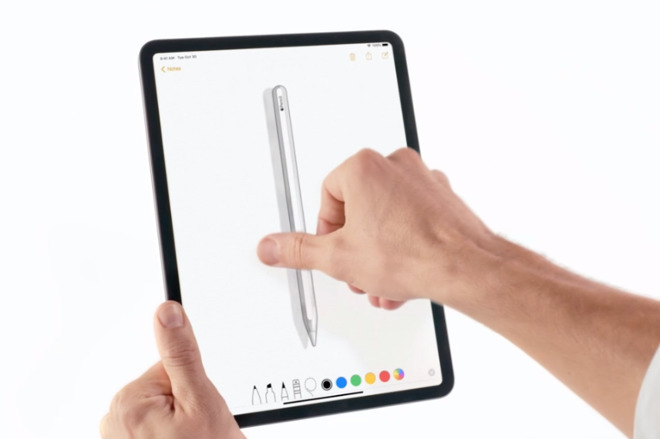 AppleInsider makes notes, sketches, and diagrams with the latest updates for the third generation iPad Pro, and the second generation Apple Pencil. The new second generation Apple Pencil. The Apple Pencil for iPad Pro, as Apple calls it, is unquestionably an improvement on an already excellent tool. However, to use it you also need a new iPad Pro —and you need updated apps. If you currently use the old Apple Pencil on an app on the old iPad Pro, then the new Pencil will work with that app on the new devices. 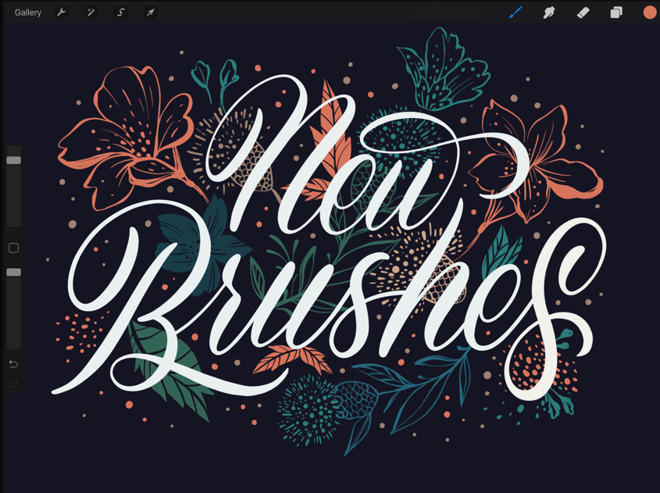 The issue is not about whether your apps will work with the new Pencil but rather whether they will yet take advantage of its new features such as double-tapping to change tools or alter the size of brush and pen stroke you make on the screen. Over time, you can be certain that any currently-supported app will add at least some support for the new Pencil features but for now, here are the ones that have already been updated. Unsurprisingly, drawing and sketching apps are among the first to take on the new Apple Pencil. Procreate 4.2.1 has added substantial support with cropping, selecting, inking and clipping features all updated to exploit both the Pencil and the iPad Pro's multi-touch screen. 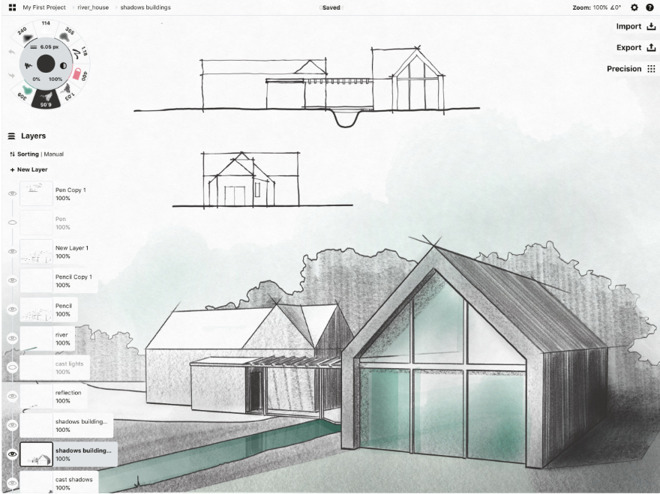 The perhaps less well-known Concepts 5.2.2 is a sketching and design app. Its new update lets you customize how the app responds to a double-tap. Similarly, Color Splash for iPad 3.1.0 adds double-tap support but in this case it's set solely to swap you between the app's color and grab modes. Silk 2 - Generative Art 2.718928 may have an unwieldy version number but this app for drawing wallpapers and mandalas now also takes advantage of the new devices. You can switch back and forth to the eraser tool or bring up a color picker. Other drawing types of graphics apps adding double-tap support include Clip Studio Paint for Manga 1.8.3, iPastels 3.4, Lux Draw 3.2 and Graphic for iPad 3.5. The diagramming and design tool OmniGraffle 3.8 adds particularly comprehensive support for the Pencil and its double-tap options. 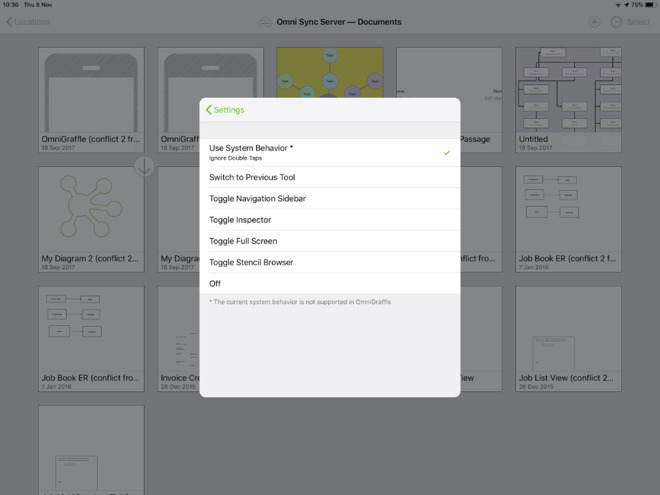 By default, OmniGraffle respects whatever preferences you've chosen for the Pencil in your iPad Pro's Settings. However, you can have it so that while you're using OmniGraffle, a double-tap on the Pencil will switch between the current and previous tool. Alternatively, it can be how you call up the app's navigation or element inspector options, it can be how you go in and out of full screen. Live Home 3D Pro is an app for designing the layout of your home or planned building. It now supports the new iPad Pros and the developers say they've "improved workflow with double-tap on Apple Pencil (2nd Generation)". Similarly, the developers of Measure Map Pro 1.9 say that updated support for the new Pencil lets you "measure distances, perimeters and areas with laser sharp precision." There's also an option to use the double-tap to switch between tools in Juxtaposer 3.13, an app for combining images into montages. One of the most creative uses for the double-tap comes from LiquidText 3.8. The quick way to describe LiquidText is to say that it's a PDF reader and editor but really it's a quite startlingly creative way to manipulate information that happens to be in a PDF. One of its key features is that you can take an excerpt of the PDF and temporarily store it on what's called a workspace to one side. Now you can draw a circle around any part of the PDF and if you double-tap the Pencil, the contents of that circle will be immediately excerpted out to the workspace. The developer promises that more options will be coming soon but for now has also done a short demo on Twitter. For marking up more regular PDFs, you can also use the newly updated Apple Pencil with PDF Expert by Readdle. Here your options are to have that double-tap either be undo or to switch between commonly-used tools. MathKey - LaTeX Converter 1.3.1 is a handwriting app that converts your scribbles into LaTeX/MathML expressions and now lets you double-tap to switch between the pen and eraser. It can also be used to call up the app's color picker. Similarly, GoodNotes 4 can now act on a double-tap but the app hasn't added any particularly specific features. It will just respect whatever preference you've chosen in iOS 12's Settings. Explain Everything Collaborate 5.2.4 is an online whiteboard that lets you work across the web with colleagues and now with the Apple Pencil second generation. In this same vein there is also Scribble Together Whiteboard 2.4.1. If you're on a FaceTime or other call with someone, you can both launch this app and sketch together. The new update supports iOS 12's default actions for the double-tap. Compared to the number of apps where you type or tap, ones that use the Apple Pencil are always going to be a little niche. However, sometimes a niche can be very well served and the addition of the right Pencil support can be a boon. 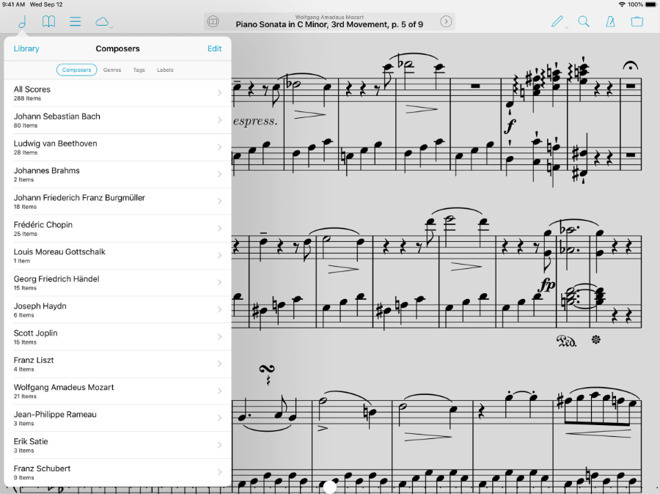 Sheet music app forScore has been updated to support the new Apple Pencil. Such as in forScore 10.5, which is an app for musicians working with sheet music. Now you can double-tap on the new Apple Pencil to either switch or adjust tools while you're annotating a piece of sheet music. When you're not actually adding or editing annotations, though, the same double-tap can be used for your choice of the app's other settings. If you were the sort to use the Apple Pencil as much as a thinking implement as a stylus, as a thing to toy with as you ponder, then hopefully you didn't also tend to tap your finger on it much. 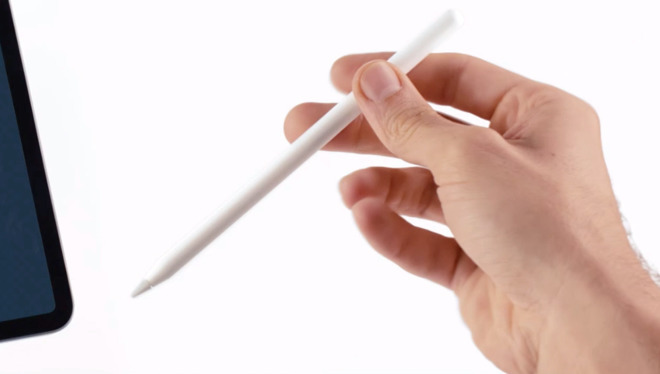 From Apple's launch video, using Apple Pencil to think with. You're going to have to train yourself out of that now and we also hope that Apple has seriously tested just how many double-taps this thing can take. It's remarkable how much use this one and rather small feature can be adapted to. You can imagine other companies would've added triple taps or put a tappable area on both sides of the Pencil. Apple has stuck to a minimalist approach and it means that the Apple Pencil's functionality has been improved in a very natural way. You don't feel as if you need to fiddle to set it up, you just write or draw as you need.